I went for a long run in the hills with my brother-in-law 10 days ago. It was very wet, windy and cold. I went over on my ankle. There I lay in the mud, clutching my ankle, screaming every four letter word in the vocab (good pain management technique). Choosing pain over death from cold, I hobbled my way towards home, even managing to break into a laboured one-legged trot now and then. The actual damage to the outside of the ankle that was sprained did not seem that serious despite the bleeding and swelling (I have such skinny ankles that swelling never looks that bad). What really hurt the most was the inside of the ankle affecting the base of the tibia bone. Well, first priority was to warm up, so it was straight into a big hot bath of Epsom Salts (And a beer!) for an hour or so as soon as I got home with my ankle propped up (elevation). I did not bother with ice or compression, much preferring elevation as the best means of preventing further bleeding while not compromising circulation and metabolism (Bear in mind that well over an hour had already passed since the sprain so the initial clotting was complete). You can see in the photos the damage to both sides of the ankle and the associated bleeding and swelling (Photos taken 12 hrs post injury). Within 12 hours I was walking carefully trying to maintain proper foot mechanics and not allowing the foot to turn outwards. Proper foot posture and normal movement during healing ensures scar tissue is laid down in the right places and in the right direction. I did not compress or ice the injury at all, preferring to continue the elevation and relying on normal movement to manage any swelling. At about 36 hours I had my partner, Alofa, commenced very gentle massage on the area to promote circulation and reduce the swelling. This massage became progressively more vigorous as each day passed with the emphasis more on softening up the injured areas. There has been no change in diet other than to take some glucosamine, chondroitin, Reparen and MSM to help recover from the destructive wrench to the joint and damage to the surrounding tendons and ligaments. 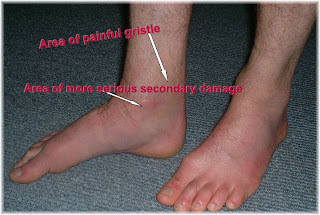 A quite large lump of hard gristle was found behind the Achilles tendon. This was an area that had given some pain over previous years when doing extremes of exercise, so the opportunity has been taken to do deep tissue massage to soften and free this up. As swelling diminished and pain disappeared it became apparent that I might have fractured the medial maleolus of the ankle. When I went over I think I compression-chipped the margin of the ankle joint and possibly caused a hairline fracture a few mm further up. Still, no worries: 10 days have passed and I am walking without a limp and kind of jogging. My goal was to be running within a week; but that might have to be put back a few weeks. While I wait for the bone to settle, I can do some house-keeping like dealing with that troublesome lump of gristle. Why didn't I go to the hospital? The thought of a hot bath was much more inviting than hanging about for hours in the A&E. If I thought it was more serious than it first appeared I would have been off to the Doc the next day. Going straight to hospital risks sitting about with the ankle blowing up with blood. Medically there is nothing that can be done other than to x-ray, strap the ankle, give you a pair of crutches and show your the door! It is better to go home and stabilise the injury, get warm and dry and have a feed. If you think you fractured your ankle shouldn't it be in plaster? Probably, but it is not an unstable fracture as far as I can tell and so long as I am careful it should heal quickly. Besides, I am able to maintain muscle strength and balance thus avoiding the problems of rehab once plaster is removed. Why did you sprain your ankle? Other than the fact I was running down a very muddy, slippery trail, I think it has a lot to do with my shoes. I switched from wearing Asics trail shoes to a similar pair of Nike. I mildly sprained my ankle the first run in the Nike and a further time not long ago. This is despite them being designed for off-road stability. I think I am being sent a message: go back to the Asics!! For the latest article about this injury go here. I've always told you gary mountain walking is a far beter sport, at least we wear shoes that have ankle support for when those unforseen ankle turns happen ! some days are better left to tramping boots.